Little River Mechanics' Institute Hall. 1910-2010. The Mechanics' Institute movement began in British urban industrial centres in the early 1800s. A "mechanic" was a person applying skills and technology. During the 19th century, most towns in Victoria established a Mechanics' Institute or Athenaeum with a library and meeting hall. Common objects were the "spread of useful knowledge" and provision for "rational recreation" in the community. A Mechanics’ Institute was established in Little River in 1908. This plaque, No. 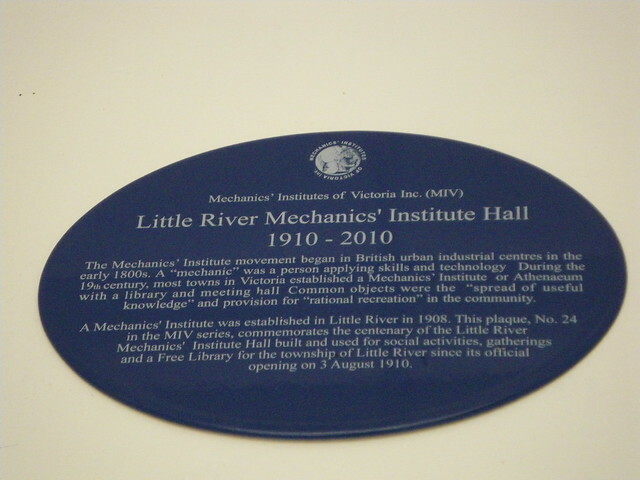 24 in the MIV series, commemorates the centenary of the Little River Mechanics’ Institute Hall built and used for social activities, gatherings and a Free Library for the township of Little River since its official opening on 3 August 1910.